What could be worse than a garbage disposal clog. The idea behind a kitchen sink is to keep the dishes clean. A clogged sink works against that. The other part of the problem is that you probably put a lot of food waste in it before you knew it was clogged. Could be a little messy. You have the skills to fix it, don't despair. For related information see the articles 'Troubleshooting Garbage Disposal Problems' and 'Sink Drain Plumbing Problems'. What can you do to solve this problem? Take a look at the evaluations and the steps below for guidance. See if this is something you want to try and fix yourself. In the last step there are some guidelines for avoiding a clog in the future. Before you proceed you will need to determine where and what your problem is. Is the disposal jammed? Is it the disposal drain or the sink drain that is clogged? 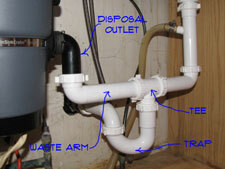 The information below has everything you need to take care of a garbage disposal clog. Unclogging a garbage disposal should be a service call. Around $50 to $75. Of course if the technician just finished his up selling course he may try to convince of the wisdom in replacing the unit. Could be upwards of two hundred dollars if he is successful. Most of the time you have to take the drain apart to get the clog out. This is a little more challenging than just using a plunger. Is the unit running? Or is the power off? Check the plug, GFCI and breaker in that order. A jammed unit may not drain. Make sure the unit is turning freely before you tear the drain apart. A sink full of dirty water could wind up all over the floor. Have a pail ready if you take the drain apart. Taking apart the drain will render the sink unusable, so make sure you are in a position to get it back together. You begin troubleshooting disposal clogs by a process of elimination. There is just a short section between your disposal and the sink drain. Yes certain types of food waste can clog this location. See below for narrowing down your problem. You can get a garbage disposal clog in two ways. One you get a clog in the unit itself. This is usually taken care of when you turn the unit on. Try that first, run the disposal and see if the water goes down. Yes, boy that was easy. No? I know you probably already thought of running the unit. It just runs and the water doesn't go anywhere. You definitely have a clog. Is the garbage disposal jammed? Are you getting that loud electrical sound when you turn the switch on? Yes, well you have a different problem. 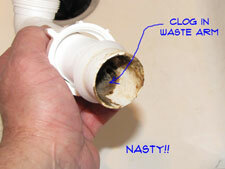 Go to the article 'Fixing a Jammed Garbage Disposal', to find out about this problem. Once you free up the motor the water will likely drain down. The next question you have to answer is whether the water is backed up in both sinks? Yes, this means that the sink drain is clogged and not the garbage disposal. 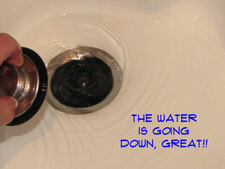 Go to the article 'Fixing a Clogged Sink Drain', for the correct information. The problem is similar, but at a different location in the drain. Is it only the sink that has the disposal attached? Yes, then the problem is probably between the disposal outlet and the tee in the drain where the two sink drains connect together. Your garbage disposal has clogged the drain. See the information below for the instructions on dealing with this problem. WARNING!! Keep Your Fingers Out of the Disposal!!! Turn the Power Off Before Working On It!!! WARNING!!! Plunging a garbage disposal is usually not a good idea. For a clog in the drain that won't go away when the unit is turned on, you cannot generate enough pressure. Plungers work by creating pressure against the clog. Since the disposal has blades and a turntable in the way it tends to diffuse the pressure created by the plunger. Either that or garbage disposal clogs are harder to free up than other clogs. The plunger is certainly worth a try, since it is easier than the alternative. A word of caution here. It is possible to blow the fittings on the drain apart with a plunger. If that happens you will have a mess on your hands. 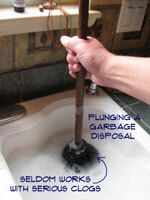 Clean the area out under the sink and have a pail in place under the drain. Keep some rags handy for any splashing that may occur. Make sure you have enough water in the sink to cover the base of the plunger. Make sure the plunger is seated and then push down quickly and firmly. Give it a several good tries to see if you can break the clog free. It worked? Great, you have taken care of your garbage disposal clog. No? Bummer, go to Step Three for further instructions. 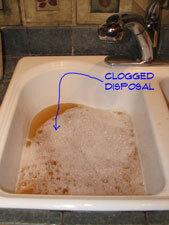 Checking a disposal drain is the first place to look for a clog. There is a tailpiece that is attached to the disposal and a waste arm that connects it to the sink drain. This short section of pipe is where the problem will be. Before you do anything you will need to examine your sink drain. Is it white or black plastic? Yes, that is good news from a repair point of view. The plastic is easier to work with. Is it brass or chrome metal? Yes, not so good. For a sink drain that is metal you will need to examine it to see how bad of shape it is in. Does is look corroded? Does it look like it will fall apart when you touch it? Yes? You probably need to think about replacing some or all of the drain parts. Don't get too upset, they are not that expensive. Make a list of what you think you need. If you go to a home supply store you may find kits that deal with your situation. A word of caution. The kits always seem to be short a nut and washer. Buy a couple extra ones at the same time. For a drain that is not exposed to view plastic is the way to go. For more information on working with sink drains you want to see the article 'Sink Drain Plumbing'. 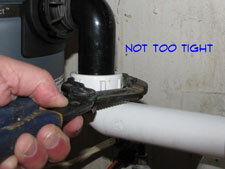 This article will give you tips and tricks for cutting, tightening and checking your drains. Make sure the power is turned off to the disposal before you work on it. With a pair of adjustable pliers you want to loosen the nuts on the tailpiece for the disposal. The tailpiece may be attached to the disposal via a plate that has screws holding it in place. Loosen the screws. make sure you have a pail under the drain to catch the water. Loosen the fittings enough to let the water drain out. Let it drain completely before proceeding. After the water has drained out you should be able to remove the tail piece and the pipe that leads to the tee. Do you see the clog? Take a stick and clean out the clog. Into the trash is a likely choice. With the clog removed you can put the drain back together. Install the existing or new pieces as required. Tighten the fittings snugly and then try the disposal. Run water down it gingerly until you are sure it is draining correctly. The disposal is running and the water is going down? Great, you are done fixing this garbage disposal clog. Checking a disposal drain did not turn out to be that difficult. Garbage disposal maintenance does not need to sound ominous. Caution with certain material and a lot of water are mostly all that is needed. I had a disposal that would clog every time you put a lot of raw vegetable material in it. The fibers would bind up into a tight ball inside the drain. The obvious solution would be to throw material like that away. Or to grind it up slowly with a lot of water. Any material that you know will give your disposal trouble should be fed in slowly with a lot of water. The more water the better. Let the water run for several seconds after the disposal is done grinding. This will help to flush out the pipes after each use. Newer heavy duty units have two stage grinding capabilities and are less prone to clogging. They grind the food up finer, so that it flushes through drain better. Replacing you garbage disposal is an option but usually not a necessity. Hopefully you were able to take care of your problem in a half an hour or so. Maybe you had to buy a few parts. Not too expensive I hope. You may have been among the fortunate few that succeeded with a plunger. I never could get a plunger to work. I just gave up after a while. Worst case is that you took a look at your disposal and decided that it was beyond hope. Even replacing a garbage disposal is not that hard. With your garbage disposal clog gone you can now move on to other rewarding pursuits.